Ever wondered why religious orders dedicated to poverty would build enormous churches filled with monuments to the wealthy and masterpieces of art? According to this wonderful history by Caroline Bruzelius, these are questions that members of the Franciscan and Dominican orders argued about from the beginning. Though both were mendicant (begging) orders, they had very different foundings. The Franciscans began as a lay movement while the Dominicans were founded as clerical preachers. That led to a greater emphasis on hierarchy, order, and stability among the Ordo Praedicatorum. While often building their churches outside the city center where land was available and there was less competition with secular parishes, the mendicants also took over declining Benedictine monasteries in the city centers. Early on the Dominicans embraced the architecture of the monastic cloister along with the chapter house and the separate monastic choir. The Franciscans followed suit. Both orders had rules against owning land and buildings or dealing with money, but their rapid success required them to find ways to build. Sometimes planned from the beginning, other times growing organically, large mendicant complexes were constructed in phases. Typically, friars were given a small chapel to use that would be replaced by a larger chapel for the religious community (with little emphasis on the laity). Later, this church would be replaced or added onto with a nave for the laity. Generals of the orders, such as Bonaventure, wrote against size, height, ostentation, stained glass, and lay burials. However, from early on, greater dignity was permitted for the choir and sanctuary areas. This resulted in naves for the laity with simple brick columns and trussed ceilings separated from the nave of the friars, which would have more ornate columns, vaulted ceilings, and side chapels. The allowance for vaulted ceilings gave the apse and choir greater importance as well as better acoustics. The popularity of pilgrimages to Assisi after the death of Saint Francis led to the construction of a unique and beautifully decorated basilica for his tomb. It also inspired the Dominicans to renovate and rename their mother church in Bologna as a pilgrimage site for Saint Dominic. 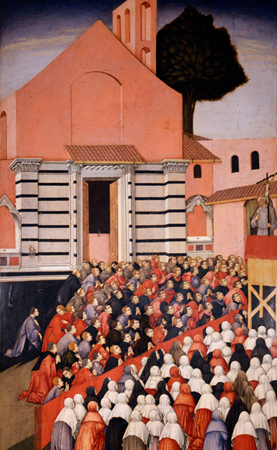 One of the early distinguishing characteristics of the mendicants, appreciated by popes and reform-minded bishops, was their emphasis on outdoor preaching against heresy. Some communes supported this activity by assisting in the construction of churches and in the clearing of large piazze for preaching. A good example of this is the piazza nuova in front of Santa Maria Novella in Florence, designated by the city as a site for preaching in perpetuity. Moveable wooden pulpits were employed in the piazze, and in some cases stone pulpits were built onto the church exteriors such as at San Eustorgio in Milan, San Domenico in Bologna (demolished), and San Domenico in Naples. Later, large stone pulpits with sculptural panels were built inside mendicant churches on the laity side of the rood screen. This is a story of two great religious orders that saw tremendous growth during the Middle Ages. In spite of their founding emphasis on poverty and serving the poor, success necessitated architecture. Generally the mendicants started with simple structures that later had their walls demolished so that apses and naves could be extended and side chapels built onto them. Theirs was an architecture of accretion. But how did all of this get paid for, if the friars were not supposed to own land or employ money? By the laity, both the wealthy and the middle class. The Franciscan and Dominican orders were founded to root out heresy, so naturally they later became the inquisitors, which they often benefited from financially. This and the assistance friars gave in the development of wills and donations for intercessory prayer and burial brought in large sums of money. Bruzelius cites many examples of abuses by the Franciscans and Dominicans that should temper the popular belief that the Gothic period was the golden age of Christianity. However, these great buildings continue to preach the truths of the faith and witness to the devotion inspired by the followers of Saints Francis and Dominic.